We went MIA. Which is completely inconsiderate to the many of you obviously concerned we were abducted in a scarier van than the one we live in…Actually none of you were concerned. And if we HAD gone missing, we’d still be missing thanks to you. We took a temporary hiatus from #vanlife to be even more homeless. Le vi had to do hospital rotations for medical school in several places back East. So for months we lived out of carry-on suitcases and slept on couches, air mattresses, Airbnbs, free hotel rooms on interview days, friends’ homes and even in a tent in a stranger’s unfinished basement in Michigan. Long story short, it was awesome because people are generous and cool. And we are shameless and moochers. Would you believe the whole time we were gone Levi was homesick. FOR THE VAN?? I was pretty content living off other peoples’ food and utilities, but when we saw the van for the first time in months, parked in a dusty, crowded RV storage lot, it really was like coming home. (Well except that we had to jump it). So now we are back! Basically nothing. The weather hasn’t even changed. It’s amazing. It’s a little less sweaty in the morning, and the sun sets sooner. But you don’t need me to tell you that. Levi’s schedule is more relaxed and, so far, so is mine. As a result we are soaking up the simple life a little more in this winter edition of #vanlife. (Cue the Step By Step theme song. I wasn’t allowed to watch that show as a kid. I really couldn’t tell you why, but I always felt a rebellious thrill trying to watch the entire opening credits before my mom shouted to turn it off). Actually use the gym to work out and not just to shower. Eat better…and cheaper. I don’t know how that’s going to work. Suggestions are WELCOME. Once on a visit to a small island off the coast of Belize with no cars, we made the mistake of walking too fast. Hand-written “GO SLOW” signs posted all over the island were meant to serve as reminders. As we were mindlessly rushing, like true Americans, we were stopped by two very serious men shouting, “‘EY!” They looked at us with caution and forewarning, “..Go slow.” We chuckled and kept walking. They stepped in our path. This wasn’t a joke. This time more as a threat, “Go. Slow.” I realized then it is possible to take relaxation very seriously. And this time around I want to be more serious about the less-than-serious lifestyle we have chosen. I promise my fourth goal is to do more documenting on the blog and instagram. I would have put it on the list, but three feels more polished. 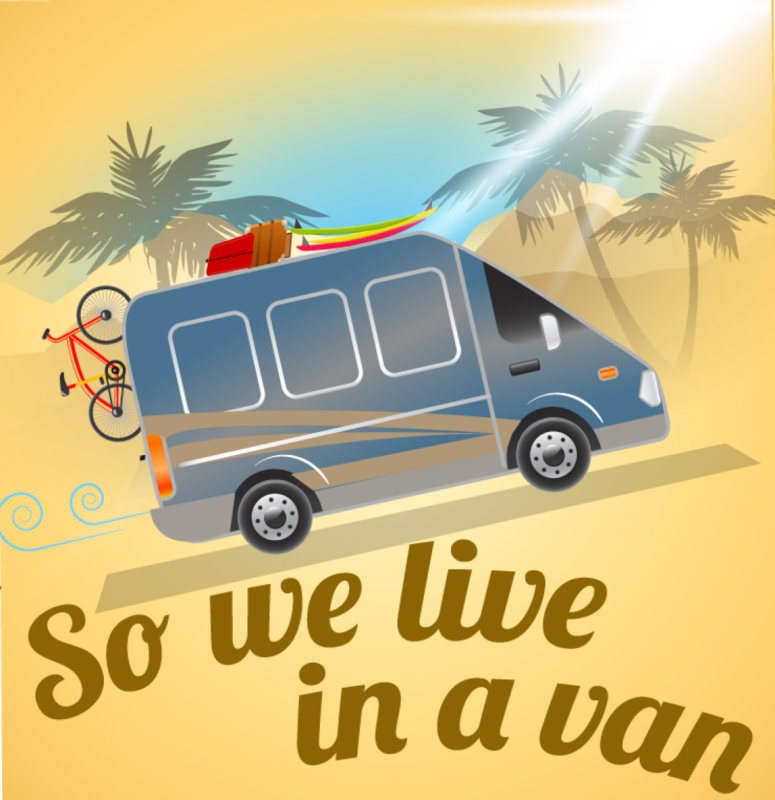 So for the next two months, may we present…So We Live In a Van: The Sequel. Let’s hope, unlike many films, books and marriages, the second one is just as good. This may possibly/hopefully be your last opportunity to live in the van so enjoy every day! Glad to be back! Its like being on vacation every day, except when you have to pee in the middle of the night. Wow! I just now found out you live in a van! This is quite entertaining. Needing to pee in the middle of the night must be like being on a long road trip with no pit stops. Thanks everyone! And Glen, you are exactly right.